I had an old school friend coming over for dinner and I fancied trying something new. I wanted something that I could make in advance (if you make the arancini up to covering with breadcrumbs, you can keep them in the fridge until you’re ready) so I could spend most of the evening chatting with her rather than slaving over a hot stove. 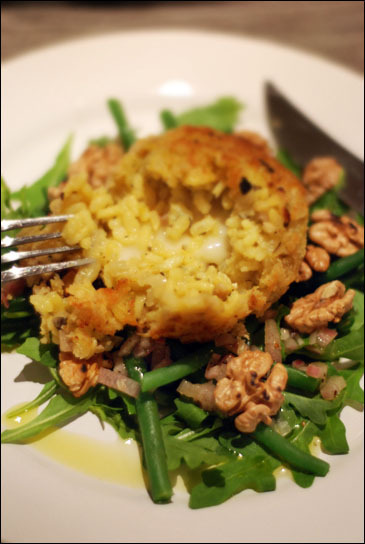 I first had arancini many years ago at my aunt's house in Rome. She had bought them from a local deli up the road, and I instantly fell in love. These are slightly different as I recall the original were longer and thinner, had anchovies in them and used mozzarella instead of taleggio, but they make a delicious subsitute. While the arancini are in the oven, prepare your vinaigrette, mixing the oil, shallot, white wine vinegar, sugar, salt and pepper, and put the beans on to boil for about 4 minutes. Drain and refresh in icy cold water. Toss with the rocket, pour over the dressing and sprinkle over the walnuts. Place the arancini on top to serve (1-2 per person is masses).